In the latest effort to resolve this conundrum, two physicists have proposed that dark matter is capable of changing phases at different size scales. Justin Khoury, a physicist at the University of Pennsylvania, and his former postdoc Lasha Berezhiani, who is now at Princeton University, say that in the cold, dense environment of the galactic halo, dark matter condenses into a superfluid — an exotic quantum state of matter that has zero viscosity. If dark matter forms a superfluid at the galactic scale, it could give rise to a new force that would account for the observations that don’t fit the cold dark matter model. Yet at the scale of galaxy clusters, the special conditions required for a superfluid state to form don’t exist; here, dark matter behaves like conventional cold dark matter. Superfluids don’t exist in the everyday world — it’s too warm for the necessary quantum effects to hold sway. Because of that, “probably ten years ago, people would have balked at this idea and just said ‘this is impossible,’” said Tait. But recently, more physicists have warmed to the possibility of superfluid phases forming naturally in the extreme conditions of space. Superfluids may exist inside neutron stars, and some researchers have speculated that space-time itself may be a superfluid. So why shouldn’t dark matter have a superfluid phase, too? The dark matter particles that would make Khoury and Berezhiani’s idea work are emphatically not WIMP-like. WIMPs should be pretty massive as fundamental particles go — about as massive as 100 protons, give or take. For Khoury’s scenario to work, the dark matter particle would have to be a billion times less massive. Consequently, there should be billions of times as many of them zipping through the universe — enough to account for the observed effects of dark matter and to achieve the dense packing required for a superfluid to form. In addition, ordinary WIMPs don’t interact with one another. Dark matter superfluid particles would require strongly interacting particles. The next step for Khoury and Berezhiani is to figure out how to test their model — to find a telltale signature that could distinguish this superfluid concept from ordinary cold dark matter. One possibility: dark matter vortices. In the lab, rotating superfluids give rise to swirling vortices that keep going without ever losing energy. Superfluid dark matter halos in a galaxy should rotate sufficiently fast to also produce arrays of vortices. If the vortices were massive enough, it would be possible to detect them directly. In physics, if you disturb a field, you’ll often create a wave. Shake some electrons — for instance, in an antenna — and you’ll disturb an electric field and get radio waves. Wiggle the gravitational field with two colliding black holes and you’ll create gravitational waves. Likewise, if you poke a superfluid, you’ll produce phonons — sound waves in the superfluid itself. These phonons give rise to an extra force in addition to gravity, one that’s analogous to the electrostatic force between charged particles. “It’s nice because you have an additional force on top of gravity, but it really is intrinsically linked to dark matter,” said Khoury. “It’s a property of the dark matter medium that gives rise to this force.” The extra force would be enough to explain the puzzling behavior of dark matter inside galactic halos. Yet no one has ever seen a WIMP, and those hypothesized extensions of the Standard Model haven’t shown up in experiments either, much to physicists’ disappointment. With each new null result, the prospects dim even more, and physicists are increasingly considering other dark matter candidates. “At what point do we decide that we’ve been barking up the wrong tree?” said Stacy McGaugh, an astronomer at Case Western Reserve University. While researchers have been playing with superfluids for many decades, particle physicists are only just beginning to appreciate the usefulness of some of the ideas coming from subjects like condensed matter physics. Combining tools from those disciplines and applying it to gravitational physics might just resolve the longstanding dispute on dark matter — and who knows what other breakthroughs might await? Dan Hooper, Fermi National Accelerator Laboratory and the University of Chicago. It took decades for dark matter to enter the lexicon of particle physics. Today, explaining the nature and abundance of dark matter is one of the most pressing problems in the field. Astronomers have long contemplated the possibility that there may be forms of matter in the universe that are imperceptible, either because they are too far away, too dim or intrinsically invisible. Lord Kelvin was perhaps the first, in 1904, to attempt a dynamical estimate of the amount of dark matter in the universe. His argument was simple yet powerful: if stars in the Milky Way can be described as a gas of particles acting under the influence of gravity, one can establish a relationship between the size of the system and the velocity dispersion of the stars. Henri Poincaré was impressed by Kelvin’s results, and in 1906 he argued that since the velocity dispersion predicted in Kelvin’s estimate is of the same order of magnitude as that observed, “there is no dark matter, or at least not so much as there is of shining matter”. Several other lines of evidence began to appear that supported the same conclusion. In 1974, two influential papers (by Jaan Einasto, Ants Kaasik and Enn Saar, and by Jerry Ostriker, Jim Peebles and Amos Yahil) argued that a common solution existed for the mass discrepancies observed in clusters and in galaxies, and made the strong claim that the mass of galaxies had been until then underestimated by a factor of about 10. By the end of the decade, opinion among many cosmologists and astronomers had crystallised: dark matter was indeed abundant in the universe. Although the same conclusion was reached by many groups of scientists with different subcultures and disciples, many individuals found different lines of evidence to be compelling during this period. Some astronomers were largely persuaded by new and more reliable measurements of rotation curves, such as those by Albert Bosma, Vera Rubin and others. Others were swayed by observations of galaxy clusters, arguments pertaining to the stability of disc galaxies, or even cosmological considerations. Despite disagreements regarding the strengths and weaknesses of these various observations and arguments, a consensus nonetheless began to emerge by the end of the 1970s in favour of dark-matter’s existence. From our contemporary perspective, it can be easy to imagine that scientists in the 1970s had in mind halos of weakly interacting particles when they thought about dark matter. In reality, they did not. Instead, most astronomers had much less exotic ideas in the form of comparatively low-luminosity versions of otherwise ordinary stars and gas. Over time, however, an increasing number of particle physicists became aware of and interested in the problem of dark matter. This transformation was not just driven by new scientific results, but also by sociological changes in science that had been taking place for some time. Half a century ago, cosmology was widely viewed as something of a fringe science, with little predictive power or testability. Particle physicists and astrophysicists did not often study or pursue research in each other’s fields, and it was not obvious what their respective communities might have to offer one another. More than any other problem in science, it was dark matter that brought particle physicists and astronomers together. As astrophysical alternatives were gradually ruled out one by one, the view that dark matter is likely to consist of one or more yet undiscovered species of subatomic particle came to be held almost universally among both particle physicists and astrophysicists alike. While this is still a long way from acknowledging the dynamical evidence for dark matter, it was an indication that physicists were beginning to realise that weakly interacting particles could be very abundant in our universe, and may have had an observable impact on its evolution. In 1980, the possibility that neutrinos might make up the dark matter received a considerable boost when a group studying tritium beta decay reported that they had measured the mass of the electron antineutrino to be approximately 30 eV – similar to the value needed for neutrinos to account for the majority of dark matter. Although this “discovery” was eventually refuted, it motivated many particle physicists to consider the cosmological implications of their research. No image caption, no image credit. Although we know today that dark matter in the form of Standard Model neutrinos would be unable to account for the observed large-scale structure of the universe, neutrinos provided an important template for the class of hypothetical species that would later be known as weakly interacting massive particles (WIMPs). Astrophysicists and particle physicists alike began to experiment with a variety of other, more viable, dark-matter candidates. The idea of neutrino dark matter was killed off in the mid-1980s with the arrival of numerical simulations. 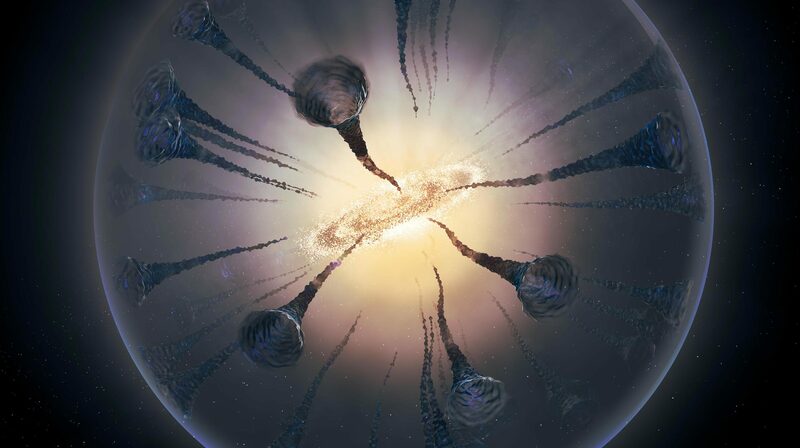 These could predict how large numbers of dark-matter particles would evolve under the force of gravity in an expanding universe, and therefore allow astronomers to assess the impact of dark matter on the formation of large-scale structure. In fact, by comparing the results of these simulations with those of galaxy surveys, it was soon realised that no relativistic particle could account for dark matter. Instead, the paradigm of cold dark matter – i.e. made of particles that were non-relativistic at the epoch of structure formation – was well on its way to becoming firmly established. Meanwhile, in 1982, Jim Peebles pointed out that the observed characteristics of the cosmic microwave background (CMB) also seemed to require the existence of dark matter. If just baryons existed, then one could only explain the observed degree of large-scale structure if the universe started in a fairly anisotropic or “clumpy” state. But by this time, the available data already set an upper limit on CMB anisotropies at a level of 10–4 – too meagre to account for the universe’s structure. Peebles argued that this problem would be relieved if the universe was instead dominated by massive weakly interacting particles whose density fluctuations begin to grow prior to the decoupling of matter and radiation during which the CMB was born. Among other papers, this received enormous attention within the scientific community and helped establish cold dark matter as the leading paradigm to describe the structure and evolution of the universe at all scales. Neutrinos might be the only known particles that are stable, electrically neutral and not strongly interacting, but the imagination of particle physicists did not remain confined to the Standard Model for long. Instead, papers started to appear that openly contemplated many speculative and yet undiscovered particles that might account for dark matter. In particular, particle physicists began to find new candidates for dark matter within the framework of a newly proposed space–time symmetry called supersymmetry. The cosmological implications of supersymmetry were discussed as early as the late 1970s. In Piet Hut’s 1977 paper on the cosmological constraints on the masses of neutrinos, he wrote that the dark-matter argument was not limited to neutrinos or even to weakly interacting particles. The abstract of his paper mentions another possibility made within the context of the supersymmetric partner of the graviton, the spin-3/2 gravitino: “Similar, but much more severe, restrictions follow for particles that interact only gravitationally. This seems of importance with respect to supersymmetric theories,” wrote Hut. In their 1982 paper, Heinz Pagels and Joel Primack also considered the cosmological implications of gravitinos. But unlike Hut’s paper, or the other preceding papers that had discussed neutrinos as a cosmological relic, Pagels and Primack were keenly aware of the dark-matter problem and explicitly proposed that gravitinos could provide the solution by making up the missing mass. In many ways, their paper reads like a modern manuscript on supersymmetric dark matter, motivating supersymmetry by its various attractive features and then discussing both the missing mass in galaxies and the role that dark matter could play in the formation of large-scale structure. Around the same time, supersymmetry was being further developed into its more modern form, leading to the introduction of R-parity and constructions such as the minimal supersymmetric standard model (MSSM). Such supersymmetric models included not only the gravitino as a dark-matter candidate, but also neutralinos – electrically neutral mixtures of the superpartners of the photon, Z and Higgs bosons. Over the past 35 years, neutralinos have remained the single most studied candidate for dark matter and have been the subject of many thousand scientific publications. Papers discussing the cosmological implications of stable neutralinos began to appear in 1983. In the first two of these, Weinberg and Haim Goldberg independently discussed the case of a photino (a neutralino whose composition is dominated by the superpartner of the photon) and derived a lower bound of 1.8 GeV on its mass by requiring that the density of such particles does not overclose the universe. A few months later, a longer paper by John Ellis and colleagues considered a wider range of neutralinos as cosmological relics. In Goldberg’s paper there is no mention of the phrase “dark matter” or of any missing mass problem, and Ellis et al. took a largely similar approach by simply requiring only that the cosmological abundance of neutralinos not be so large as to overly slow or reverse the universe’s expansion rate. Although most of the papers on stable cosmological relics written around this time did not yet fully embrace the need to solve the dark-matter problem, occasional sentences could be found that reflected the gradual emergence of a new perspective. During the years that followed, an increasing number of particle physicists would further motivate proposals for physics beyond the Standard Model by showing that their theories could account for the universe’s dark matter. In 1983, for instance, John Preskill, Mark Wise and Frank Wilczek showed that the axion, originally proposed to solve the strong CP problem in quantum chromodynamics, could account for all of the dark matter in the universe. In 1993, Scott Dodelson and Lawrence Widrow proposed a scenario in which an additional, sterile neutrino species that did not experience electroweak interactions could be produced in the early universe and realistically make up the dark matter. Both the axion and the sterile neutrino are still considered as well-motivated dark-matter candidates, and are actively searched for with a variety of particle and astroparticle experiments. In the early 1980s there was still nothing resembling a consensus about whether dark matter was made of particles at all, with other possibilities including planets, brown dwarfs, red dwarfs, white dwarfs, neutron stars and black holes. Kim Griest would later coin the term “MACHOs” – short for massive astrophysical compact halo objects – to denote this class of dark-matter candidates, in response to the alternative of WIMPs. There is a consensus today, based on searches using gravitational microlensing surveys and determinations of the cosmic baryon density based on measurements of the primordial light-element abundances and the CMB, that MACHOs do not constitute a large fraction of the dark matter. An alternative explanation for particle dark matter is to assume that there is no dark matter in the first place, and that instead our theory of gravity needs to be modified. This simple idea, which was put forward in 1982 by Mordehai Milgrom, is known as modified Newtonian dynamics (MOND) and has far-reaching consequences. At the heart of MOND is the suggestion that the force due to gravity does not obey Newton’s second law, F = ma. If instead gravity scaled as F = ma2/a0 in the limit of very low accelerations (a << a0 ~ 1.2 × 10−10 m/s2), then it would be possible to account for the observed motions of stars and gas within galaxies without postulating the presence of any dark matter. In 2006, a group of astronomers including Douglas Clowe transformed the debate between dark matter and MOND with the publication of an article entitled: A direct empirical proof of the existence of dark matter. In this paper, the authors described the observations of a pair of merging clusters collectively known as the Bullet Cluster (image above left). As a result of the clusters’ recent collision, the distribution of stars and galaxies is spatially separated from the hot X-ray-emitting gas (which constitutes the majority of the baryonic mass in this system). A comparison of the weak lensing and X-ray maps of the bullet cluster clearly reveals that the mass in this system does not trace the distribution of baryons. Another source of gravitational potential, such as that provided by dark matter, must instead dominate the mass of this system. Following these observations of the bullet cluster and similar systems, many researchers expected that this would effectively bring the MOND hypothesis to an end. This did not happen, although the bullet cluster and other increasingly precise cosmological measurements on the scale of galaxy clusters, as well as the observed properties of the CMB, have been difficult to reconcile with all proposed versions of MOND. It is currently unclear whether other theories of modified gravity, in some yet-unknown form, might be compatible with these observations. Until we have a conclusive detection of dark-matter particles, however, the possibility that dark matter is a manifestation of a new theory of gravity remains open. Today, the idea that most of the mass in the universe is made up of cold and non-baryonic particles is not only the leading paradigm, but is largely accepted among astrophysicists and particle physicists alike. Although dark-matter’s particle nature continues to elude us, a rich and active experimental programme is striving to detect and characterise dark-matter’s non-gravitational interactions, ultimately allowing us to learn the identity of this mysterious substance. It has been more than a century since the first pioneering attempts to measure the amount of dark matter in the universe. Perhaps it will not be too many more years before we come to understand what that matter is.